Somebody caught a mean case of school spirit. The first nine-episode season of the Vice Principals TV show premieres on HBO Sunday, July 17, 2016 at 10:30pm ET/PT. Watch the trailer and two teasers, below. Created by Danny McBride and Jody Hill, this dark comedy series tells the story of a high school “and the two people who almost run it, the vice principals.” McBride and Hill are executive producing with David Gordon Green and Stephanie Laing. Neal Gamby (McBride) and Lee Russell (Walter Goggins) are in an epic power struggle with one another to become school principal, when Dr. Belinda Brown (Kimberly Hébert Gregory) arrives on the scene. The Vice Principals cast also includes Georgia King, Sheaun McKinney, Edi Patterson, Ashley Spillers, Susan Park, Busy Phillips, Jennifer Gatti, Dale Dickey, Christopher Thornton, and Maya G. Love. 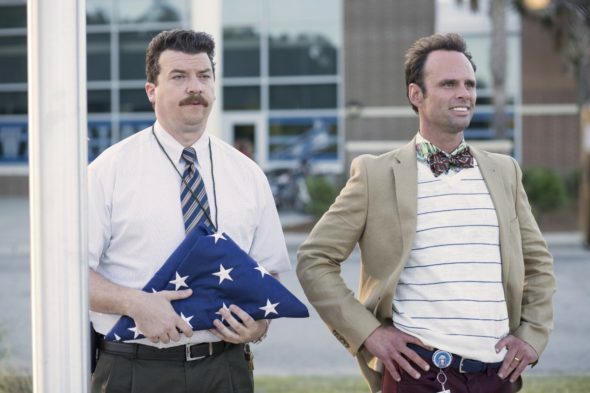 Watch the official Vice Principals TV series trailer from HBO. Here are two Vice Principals teasers. Get all the details, including episode descriptions from this HBO press release. When the longtime principal of a suburban high school steps down, ambitious vice principals Neal Gamby and Lee Russell both set their sights on the vacated top spot – only to see new rival Dr. Belinda Brown enter the picture. Putting their mutual disdain aside, these bitter antagonists form an unholy alliance to bring down the outsider by any means necessary. Created by Danny R. McBride and Jody Hill, who also created HBO’s “Eastbound & Down,” along with Ben Best, VICE PRINCIPALS tells the story of North Jackson High School and the two people who almost run it, the vice principals. McBride (“Eastbound & Down,” “This Is the End”) and Walton Goggins (Emmy® nominee for “Justified”; “The Hateful Eight”) star as the school administrators, who are in an epic power struggle, vying for the top spot: to be school principal. Joining McBride and Hill as executive producer and director is longtime collaborator David Gordon Green. Winner of the 2016 Audience Award at South by Southwest, the dark comedy series kicks off its nine-episode first season SUNDAY, JULY 17 (10:30-11:00 p.m. ET/PT), with other new episodes debuting subsequent Sundays, exclusively on HBO. Told over the course of a single school year, the first season takes place during the fall, with the second season to cover the spring term. In addition to McBride (Neal Gamby) and Goggins (Lee Russell), VICE PRINCIPALS also stars Kimberly Hébert Gregory (“Devious Maids”) as Dr. Belinda Brown; Georgia King (“The New Normal”) as English teacher Amanda Snodgrass; Busy Phillips (“Cougar Town”) as Gale, Gamby’s hot, trashy ex-wife; Shea Whigham (HBO’s “Boardwalk Empire”) as Ray, Gale’s nice-guy new husband; and Sheaun McKinney (“Know Thy Enemy”) as cafeteria worker Dayshawn. Guest stars on the first season include Bill Murray (Oscar® nominee for “Lost in Translation”) as outgoing Principal Welles; Susan Park (“Fargo”) as Christine, Russell’s wife; and Maya Love as Janelle, Gamby’s daughter. Written by Danny R. McBride & Jody Hill; directed by Jody Hill. Gamby (Danny McBride) and Russell (Walton Goggins) invade Dr. Brown’s (Kimberly Hébert Gregory) private space; a school evaluator spooks the vice principals. Gamby (Danny McBride) looks to impress Amanda (Georgia King) on a field trip organized by Mr. Hayden (Mike O’Gorman), a good-guy history teacher. Written by Danny R. McBride, John Carcieri & Adam Countee; directed by Danny McBride. The series will also be available on HBO NOW, HBO GO and HBO On Demand. The executive producers of VICE PRINCIPALS are Danny McBride, Jody Hill, David Gordon Green, Jonathan Watson and Stephanie Laing. What do you think? Do you like the sound of the Vice Principals TV series? Do you plan to watch the comedy’s premiere on HBO?